Search feature doesn't seem to work to well on this site anymore so I thought I'd start a new thread. I ordered the AGP Wastegate Actuator for my 03' PTGT. Do I need a boost controler or can I istall the wastegate on it's own? What type of BC did you use? I used a Turbo XS dual stage bc. It's manual and cheaper than an electric one. Is this the BC you installed? I like the thought of having dual stage boost control with a switch to go from one to the other. Makes sense to be able to trip a higer boost during 3rd gear, there would probably be to much wheel spin in 1st and 2nd gears if you were running 18 psi boost. 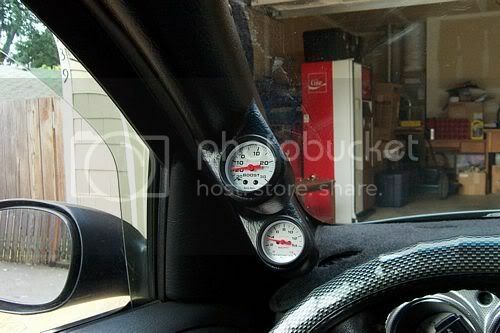 Where did you put you boost guage? I found another bc made by AEM which is a bc and a guage in one. Not sure if it has dual settings, but I like that it's a guage as well. The problem with a single stage bc is if it is set above 15 psi you will get bad PTB. Nice pillar pod, yeah I think a dual stage boost controler would be better. The search goes on.